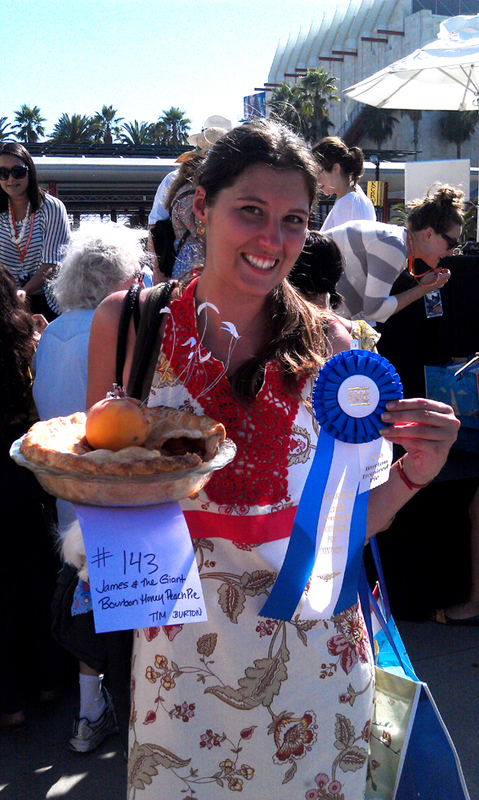 When I saw KCRW & LACMA were holding a pie contest, I was interested. When I saw that there was a category just for pies inspired by Tim Burton, I was hooked. I instantly started churning out ideas and sketching them out on scraps of paper….Jack the Pumpkin King Pumpkin Pie, Sweeney Todd “Meat” Pie, the Queen of Hearts’ Strawberry Tarts….the possibilities were endless! I couldn’t have asked for a more inspiring and creative special category and I was disappointed to find out we could only enter one pie per category. 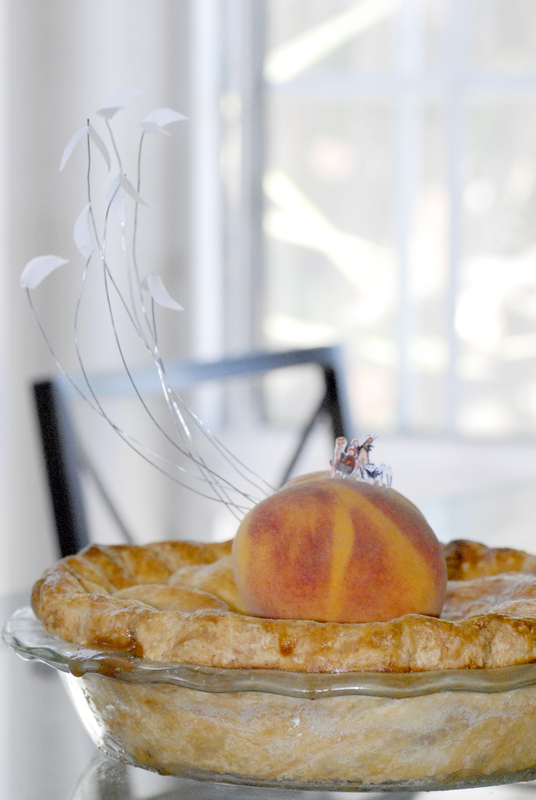 So instead of disguising my cast-off Tim Burton creations to be suitable for other categories (fruit, nut, savory, or cream/chiffon), I decided to focus all my creative and baking energy to making one really great pie: James and the Giant Peach Pie. I felt, despite the fact that the judges were a total all-star panel, that pumpkin and strawberry and meat pies are so subjective to a judge’s mood on any given day…but that no one can actually turn down a really good peach pie, no matter what their mood. Since it was for Tim Burton, I knew I had to go all out on themeing the pie and if there’s one thing I love it’s a challenge that combines baking and crafting. In “James and the Giant Peach,” the characters live inside a peach floating across the English Channel, at one point being pulled by a large flock of birds. So I went to the co-op, found the largest peach in the bin, and proudly carried it home, knowing it would be my centerpiece. I held up the line at FedEx-Kinko’s while the guy at the desk and I printed out the characters in a few different sizes for me to experiment with (and mirror images of them, so no matter what side you looked at the pie from, you wouldn’t be staring at the white back of paper). And I dashed through the craft store, wondering if I really needed a pair of needle nose pliers and wire cutters to pull off this project (I did). 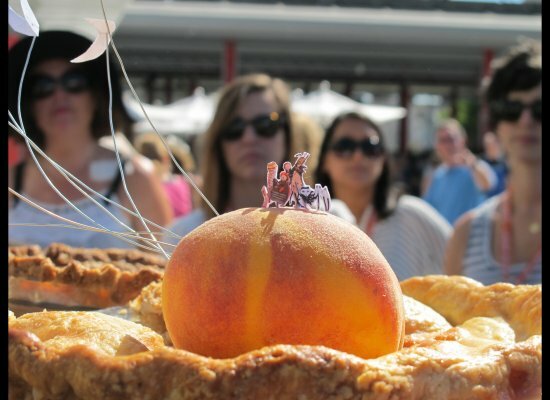 The final result was a “giant” peach, the cast of characters merrily perched on top, being pulled by birds through waves of the English Channel pie crust. There were some hurdles to jump first, though. I admit, though I love making pies, I normally have no patience for pie crust and just use frozen crust from the store (it could be because I make most of my pies around Thanksgiving when I have other things to worry about, like if I remembered the cranberries for the stuffing). These pies had to be 100% homemade and, truthfully, I’m glad for it, because the process reminded me that crust really is so simple to throw together that I should take the time to do it more often. The other hurdle was that in order to pull off my design element, I needed a little stand to hold the peach up at crust level and I didn’t know a single pizza store that still used those plastic stands to keep the box from drooping into the cheese. Imagine my delight when the hero boyfriend called from a conference he was at in San Fransisco to say that he had triumphantly found and saved two pizza box stands and he would be home on Friday with them! So with all challenges behind me and nothing left to do but bake a pie, I plunged ahead, making the crust on Saturday night and the pie early on Sunday morning, hoping it would cool off enough before having to bring it to LACMA for judging. And when all that was said and done…. Process 1 1/2 cups flour, salt, and sugar together in food processor until combined, about 2 one-second pulses. Add butter and shortening and process until homogenous dough just starts to collect in uneven clumps, about 10 seconds (dough will resemble cottage cheese curds with some very small pieces of butter remaining, but there should be no uncoated flour). Scrape down sides and bottom of bowl with rubber spatula and redistribute dough evenly around processor blade. Add remaining 1 cup flour and pulse until mixture is evenly distributed around bowl and mass of dough has been broken up, 4 to 6 quick pulses. Empty mixture into medium bowl. Place a foil lined baking sheet on the middle rack in your oven and preheat to 425 degrees. This will ensure ,when you put the pie in the oven to bake on the already hot sheet, that the butter and shortening will melt and coat the flour faster, before the peach juices get to the flour. If the butter and shortening melt first, you’ll get a flaky crust. 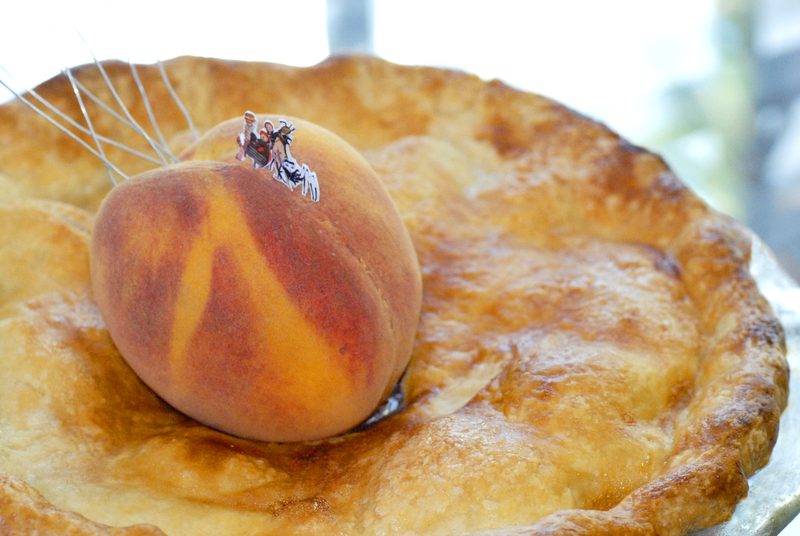 If the peach juices get to the crust first, you’ll get nothing but a soggy crust. If you have been chilling your dough overnight, pull it out now so that it can soften. You can choose to peel the peaches or not. If you do want to peel them, blanching them will make the process a lot easier. I personally just didn’t want to take the time to peel them and the pie was, obviously, fine. Slice the peaches into 8 pieces per fruit, tossing them in a bowl as you go. Pour the lemon juice over the peaches slices. In a small bowl, mix the cornstarch, flour, cinnamon, nutmeg, and salt. Pour the mixture over the peach slices and toss the peaches until evenly coated. Remove from heat and add butter, swirling pan until butter is melted. Pour over fruit and toss the peaches until evenly coated. Sprinkle a generous amount of flour on top of the first dough round and roll out 1 piece of dough into a 13-inch round on a generously floured surface. Gently roll the dough around the rolling pin and then unroll it into the pie plate, gently lifting the edges and settling it into the plate (at this point it is suggested that you chill the pie plate and crust while you roll out the other crust but truthfully, I was rushing and forgot and it was fine). Roll out the second pie crust using the same flouring methods. Spoon (or dump) the peaches into the pie crusted plate and lay the second rolled out crust on top. Trim the overhand so there’s just about a 1/2 inch left. Going around the edge, you’ll seal the juices in best if you fold the edge of the crust underneath itself before crimping or decorating it. Cut a hole about 2″ wide in the center of the top pie crust for steam to vent out. Brush the crust with the egg white and then sprinkle with sugar. Both will make the crust shiny and delicious! Bake pie on hot baking sheet 20 minutes. Reduce oven temperature to 375°F. Continue to bake until crust is golden-brown and filling is bubbling, about 50 minutes more–tent tin foil over the top of the pie if the crust starts to brown too much. Cool pie to room temperature, 3 to 4 hours. I have to admit, I was extremely hesitant about this week’s chosen recipe for Project Pastry Queen (see everyone’s results delicious results here!). After all, I have my own secret special recipe for pecan pie and, since I was bringing this into the office for our September birthday celebration, if this recipe was a flop I did NOT want people thinking this was a version of my famous Thanksgiving pie. But I saw that my fellow PPQ’ers loved the recipe and I decided to go for it and wouldn’t you know that this is a great recipe! I can definitely say this though: it is RICH. This recipe has a total of 7 cups of brown sugar in it–one cup in the crust and 6 cups in the filling. Definitely meant to be eaten in very small portions. I liked the addition of bourbon to it, though, and am even thinking about tweaking my own pie recipe just a touch to include it. Just some notes about my little changes to Rebecca’s original recipe: I left out the coconut since the recipe depended on coconut for texture, not flavor, and I’ve never really loved shredded coconut’s texture. 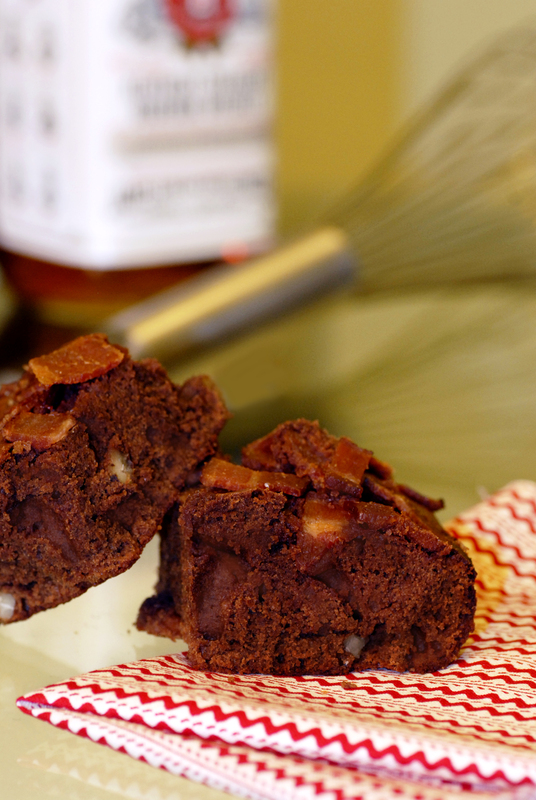 I substituted in an extra 3/4 cup of pecans to make up for any lack of texture in the filling. I also used strictly whole wheat flour in the crust here. Truth be told, it was because I was afraid I would run out of white all-purpose flour before finishing my various baking projects for the day and I have to say that I think the whole wheat flour really was a great add. It gave the crust a sweet nutty flavor that really complimented the filling instead of just being a sweet butter crust to support the filling on top of it. 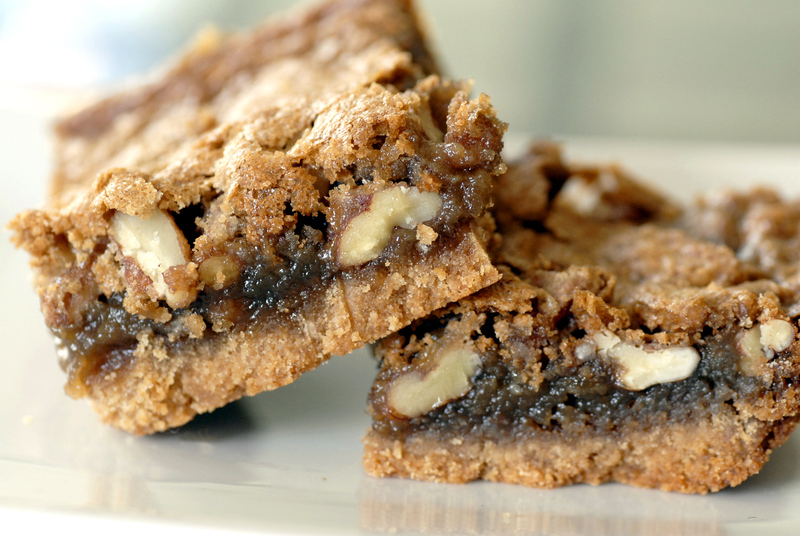 This recipe makes a huge huge batch of bars, so just beware. Also, I didn’t have the 12×17 baking dish the recipe calls for so I used my largest and second largest glass baking pans and I actually still had extra crust left over. Preheat oven to 350 degrees. Grease a 12×17″ glass baking pan (or whatever smaller glass pans you have on hand). Beat butter with an electric mixer in a large bowl on medium speed for 1 minute. Add the sugar to the butter and beat 1 minute, until fluffy. Add flour and salt, mix on low speed until evenly incorporated but still crumbly. Press the mixture evenly over the bottom of the prepared pan(s). I made sure not to let the crust get over 1/4 of an inch, which is why I had leftover crust mixture even after 2 pans. I’d rather have more filling than crust in the end, wouldn’t you? Bake the crust for 15 minutes, until it has darkened to a deep golden brown. Leave the oven set on 350 degrees while you make the filling. Whisk the eggs and sugar in a large bowl until blended. Stir in the bourbon, butter, vanilla, flour and salt until blended. Pour the filling over the crust(s). Bake until the center is set and doesn’t wobble anymore, about 25-30 minutes. Cool thoroughly, at least 30 minutes before cutting. Between my two different pans, I baked one until it was fully set and one until it was mostly set but still a little jiggly when I took it out. I preferred the one that was baked longer, as the jiggly one was a bit more oozy and less solid than the ones pictured above. It’s up to you, though!